The following is a “lesser known” example of discordant redshifts from the southern hemisphere that is known by many names. NGC 1347 was first listed as Arp 39 in Dr. Halton Arp’s Atlas of Peculiar Galaxies published by Caltech in 1966. It is listed in his and Barry Madore’s A Catalogue of Southern Peculiar Galaxies and Associations (Cambridge University Press, 1987) as AM 0327-222. But it is also listed as AM 0328-222 in Dr. Arp’s book Quasars, Redshifts and Controversies (Interstellar Media, 1987) and his article published in Volume 263 of the The Astrophysical Journal in 1982. The following is the best image I could find for this pair of objects. It is a photograph taken with the 48-inch UK Schmidt Telescope in New South Wales, Australia sometime in the 1970’s. I have cropped the original image a bit in order to fit it on this page but it is otherwise unaltered. Although the photograph is somewhat grainy it is quite apparent that there is a smaller galaxy immediately adjacent to the main galaxy at its southern end. It also appears quite possible that these two objects are physically connected. However, if they are physically connected then how to account for their vastly discordant redshifts? The redshift of the larger galaxy at 0.00587 z would place its distance at approximately 104 million light-years from Earth using a so-called Hubble Constant value of 55 (km/s)/Mpc. And although NED does not list a redshift value for the smaller object, Dr. Arp measured it to be over 0.068 z which would indicate a supposed distance of over 1.15 billion light-years from Earth. This is over 11 times the distance of the larger object. A physical connection notwithstanding, if the smaller galaxy were to be viewed at the same distance as the larger galaxy it would appear over 3 times the size of the larger galaxy. 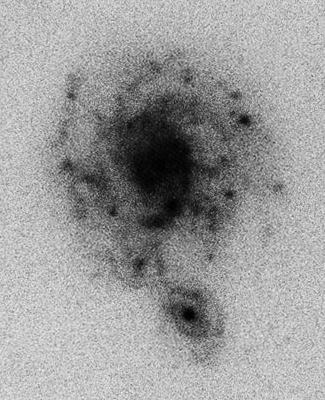 This would make it the largest galaxy ever observed for its type in the known Universe! Obviously these measurements highlight some serious discreprencies and further observations of these objects need to be made. The mission of the Discordancy Report is to show examples of redshift discordancies and present an opportunity to critically analyze the observations while also nurturing an interest to perform further observations. NGC 1347 is a perfect example of an object that clearly questions the assumption that extragalactic redshifts are indicative of distance and the result of the expansion of the Universe since the “Big Bang”. Yet, the best image I could find came from observations made over thirty years ago from a telescope less than a quarter of the size of those available today. I was unable to find any images of NGC 1347 from any modern large telescope that covers the southern hemisphere including the SALT, the Gemini South or even the HST. I will continue to pursue observational data from these and other large telescopes as their powerful optics could one day help finally bring to light the true connection between extragalactic objects and the true meaning of their discordant redshifts. I encourage all visitors to this site to pursue their own observations and please feel free to contribute to the ones I present here and even submit your own. The Seyfert galaxy NGC 7603 and its companion NGC 7603B (PGC 07041) was a close contender for my first post of discordant redshift examples. Ultimately NGC 4319 and Markarian 205 won out because it not only showed a visible connection between two discordant redshift objects but it represents a perfect example of denial and possibly even suppression by NASA and the scientific community. NGC 7603 and 7603B is actually a better example of connected discordant redshift objects. But the connection is so overwhelming obvious there can be no real denial or suppression of its existence. 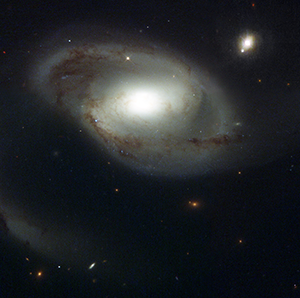 The photograph to the right shows the larger galaxy NGC 7603 clearly connected to its smaller companion galaxy NGC 7603B via a curved bridge of matter. The photograph is unaltered as downloaded from the Sloan Digital Sky Survey SkyServer website. The redshifts of the two objects have been known for some time and are discussed in Dr. Halton Arp’s books Quasars, Redshifts and Controversies (Interstellar Media, 1987) and Seeing Red: Redshifts, Cosmology and Academic Science (Apeiron, 1998). In fact, this group of objects was included as Arp 92 in Dr. Arp’s Atlas of Peculiar Galaxies published by Caltech in 1966. The redshift of the spectrum of NGC 7603 as listed in NED is 0.029524 z which would place it at a distance of over 500 million light-years from Earth using a so-called Hubble Constant value of 55 (km/s)/Mpc. However the redshift of NGC 7603B as listed in NED is 0.055742 z which would supposedly place it at almost twice that distance at over 950 million light years from Earth. It is unequivocal that the redshifts of these two visibly connected objects do not indicate distance unless one wants to entertain the notion that the bridge of connecting matter is over 450 million light-years in length. Upon closer inspection of the above photograph two smaller points of light can be seen embedded within the connecting bridge of matter between the two galaxies, one near each end of the bridge. The SkyServer site describes these objects as stars but close examination of their spectra and the spectra of the bridge itself reveals something much more intriguing. On June 13, 2000 astronomers Martin López-Corredoira and Carlos M. Gutiérrez took a detailed R-band (near infrared) photograph of NGC 7603 and NGC 7603B using the 2.6 meter Nordic Optical Telescope on the island of La Palma in the Canary Islands. They then followed up with a detailed spectroscopic analysis of the bridge of matter and embedded point objects on August 12, 2001. The image on the left is taken from their report in Astronomy & Astrophysics and has been unaltered accept for a size reduction to better fit it on this page. 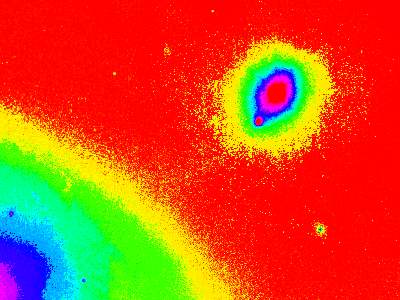 The top half of the image shows a 15-minute exposure of NGC 7603 and NGC 7603B (Object 1) in near infrared light (0.7-1.0 µm) and their redshifts which, including their range of deviation, closely match the measurements listed in NED for the two objects. Of course the most important discovery in their observations was that the two star-like objects were indeed quasars with high redshifts of 0.243 z and 0.391 z. If redshifts really did indicate distance this would place Object 2 at over 3.6 billion light-years from Earth and Object 3 at over 5.4 billion light-years respectively using a so-called Hubble Constant value of 55 (km/s)/Mpc. The bottom half of the image shows a close-up of the bridge of matter, referred to as “filament” in the A&A report. The dotted lines indicate the 5 arcsecond-wide slit in the spectrograph where the spectra of all three objects including sections of the filament itself were taken. 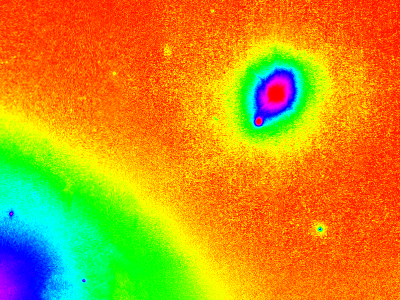 As can be seen, the redshift of the filament almost exactly matches the redshift of NGC 7603 which clearly demonstrates that the bridge of connecting matter is part of that galaxy. But most importantly this detailed view shows that regardless of the extreme distances attributed to Objects 2 and 3 because of their redshifts they are indeed embedded in the filament of matter connecting NGC 7603 and Object 1 (NGC 7603B). In fact, this detailed view shows a bulge of material extending from the right side of NGC 7603B into the connecting filament and ending at the left edge of Object 2. There is also clearly a stream of material extending out from the bottom of NGC 7603 into the filament and ending at the right edge of Object 3. You would think that the discovery of such an obvious group of vastly discordant redshifts would have garnered some sort of response from the mainstream scientific community, whether positive or negative. But unless you count the rejection of the findings by Nature and the Astrophysical Journal, there has been mostly silence. So far these observations by López-Corredoira and Gutiérrez have not been referenced in any mainstream science journals or publications, particularly by astronomers in the United States. It is very fortunate that their findings were published at all. All scientists and lovers of science should be thankful that the European Astronomy and Astrophysics Journal had the courage to do so, albeit with some help from an “anonymous” referee. For more information regarding the NGC 7603 system and its history of rejection by the scientific community I recommend reading the works of Halton Arp mentioned above and the introduction to Jeff Kanipe and Dennis Webb’s book The Arp Atlas of Peculiar Galaxies (Willmann-Bell, 2006). Do you have questions or comments about this example? Do you have an example you would like to contribute? Your input is not only welcomed, it is encouraged. Ironically, my first posted example of discordant redshifts could really serve as the one and only example I should have to post. It is not only one of the best examples of visibly connected extragalactic objects possessing two widely different redshifts, it is also a perfect example of the current scientific community’s blatant refusal to acknowledge obvious observational evidence. The photograph to the left shows the barred spiral galaxy NGC 4319 with the nearby quasar Markarian 205 to the upper right. I reduced the image size of the original uncompressed TIFF file and saved it as an image file in PNG format in order to fit it on this page and avoid any compression artifacts. I also saved all subsequent modifications of the image in PNG format to avoid compression artifacts. The original photograph can be freely downloaded in many different formats and sizes from the Hubble Space Telescope website. The caption on this page claims that these two objects are completely unrelated and unconnected. This is due to the assumption that the redshift of NGC 4319 at 0.004526 z would place its distance at approximately 80 million light-years from Earth using a so-called Hubble Constant value of 55 (km/s)/Mpc while the redshift of Markarian 205 at 0.070846 z supposedly indicates a distance of almost 1.2 billion light-years from Earth. However, careful analysis of the photograph clearly shows that the huge difference between these objects’ distances and the accepted interpretation of these objects’ redshifts cannot possibly be correct. If you look closely at the gap between the two the objects as shown in this section from the original downloaded and unaltered image you can just make out a very faint stream of matter bridging the two supposedly unconnected objects. How well you will be able to make out this bridge will depend on the contrast visible for your particular monitor. In this image I have taken the above section and modified its color palette to produce a false color image. I simply opened the image in Adobe Photoshop and chose Image from the menu bar then Adjustments > Gradient Map… and set the color gradient to one of the options available. Changing the color gradient has not modified the pixel positions of the original photograph but has set their assigned colors to a smaller and more visible range according to their brightness. 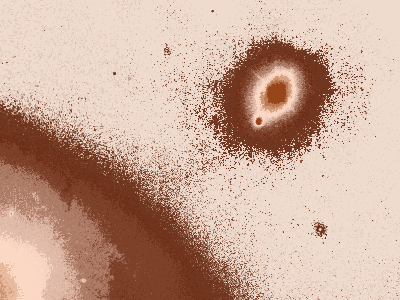 In this color palette the bridge of matter is much more visible. Several different preset color gradients are available by default in Photoshop. Here is the same section of the photograph set to another one of these preset options. Again, no pixels have been moved, added or deleted. Only the colors assigned to the pixels have been changed, making subtle differences in brightness between pixels more visible. 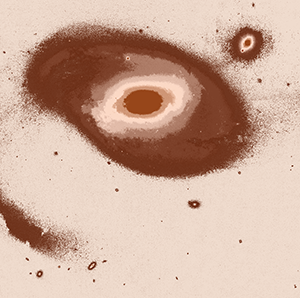 In this particular palette it is even easier to see the stream of matter extending between NCG 4319 and Markarian 205. Posterizing (Image > Adjustments > Posterize…) the section of photograph first before changing its color gradient further reduces the range of colors available so that only the largest differences in brightness are visible. Although the density of the bridge of matter has been greatly reduced it is still clearly visible in the resulting image. Changing the color gradient of the posterized image to a different palette makes the matter bridge between NGC 4319 and Markarian 205 even more obvious even though fewer overall pixels are visible in the image. 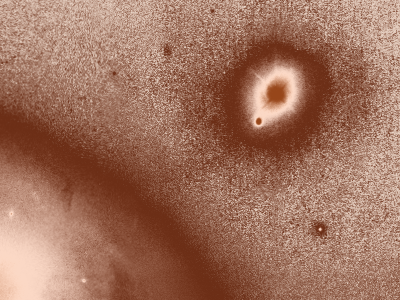 The bulge at the bottom left edge of Markarian 205 is particularly visible in this image. It is also very clear that the stream of matter exits Markarian 205 at the location of this peculiar bulge. The caption on the above mentioned Hubble Space Telescope web page also claims that Markarian 205 is over a billion light years further away than NGC 4319 because the ultraviolet light from Markarian 205 was “dimmed” as it passed through the gas of NGC 4319. Although there is clearly a bridge of matter connecting the two objects it is still possible that Markarian 205 is slightly further away from Earth than NGC 4319. Even if the distance is only hundreds of light years instead of over of a billion it is possible that the ultraviolet light of Markarian 205 was dimmed, or more precisely absorbed, by the interstellar gas of NGC 4319 on its way to us. It is also possible that if Markarian 205 was ejected from the core of NGC 4319, as has been proposed by Dr. Halton Arp, it has pulled some of the gas of NGC 4319 out with it and that is what is absorbing its ultraviolet radiation. The caption also mentions the the small bright object located just to the lower left of the core of Markarian 205. 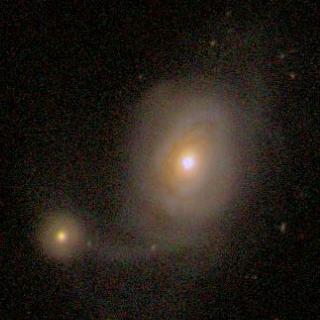 Although this compact galaxy is obviously interacting with Markarian 205 and falls directly in line between its core and outer bulge and the connecting bridge there is no redshift measurement available for this object. Obviously one of the most important steps in the future analysis of these objects is to obtain the redshift of this compact companion galaxy and see how it compares to the redshifts of Markarian 205 and NGC 4319. The Hubble Space Telescope photographs of NGC 4319 and Markarian 205 posted by NASA have always looked suspiciously underexposed to me, especially compared to those made in the past by other telescopes. But I have demonstrated that using some basic image editing tools it is very easy to make these dim pixels highly visible, thus exposing the connecting bridge of matter. 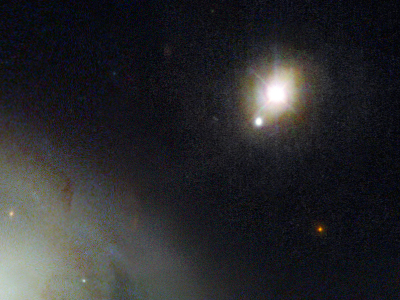 Of course I am not the first person to edit photographs of NGC 4319 and Markarian 205 in order to highlight the connecting bridge between the two objects. I am not even the first person to edit this particular Hubble Space Telescope photograph. These two objects feature prominently in Dr. Halton Arp’s books Quasars, Redshifts and Controversies (Interstellar Media, 1987), Seeing Red: Redshifts, Cosmology and Academic Science (Apeiron, 1998) and Catalogue of Discordant Redshift Associations (Apeiron, 2003) and is displayed in different color palettes on the cover of all three books. These two objects are also discussed at length in the introduction to Jeff Kanipe and Dennis Webb’s book The Arp Atlas of Peculiar Galaxies (Willmann-Bell, 2006) even though neither one is an actual Arp catalog object. These books feature detailed images and photographs including some in non-optical wavelengths. I highly recommend all of these books to anyone who is looking for more information concerning NGC 4319 and Markarian 205 and the controversy surrounding the connection between them. Questions or comments about this example? Do you have an example you would like to contribute? Your input is not only welcomed, it is encouraged. For general questions or comments about the website please contact the webmaster here.